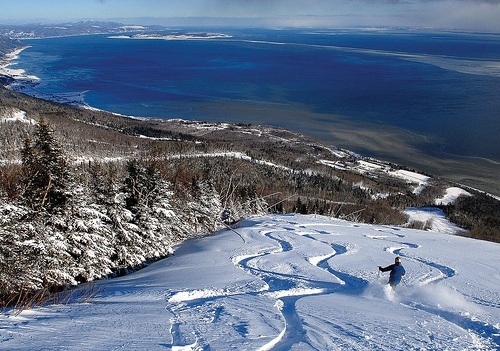 Join us in the Eastern Townships, Orford, Quebec Canada on our mid-week ski week vacation. A travel experience, just over the border, a short 3-hour drive, where the Canadian Spirit and attention to Customer Service makes this trip as close to a European Adventure as possible, without the hassle of a long and expensive flight! Join us as we continue to explore this region, visiting the four different ski resorts - each one a gem of its own, with a distinct personality. Do you want gradual groomers, glistering bumps, tenacious tree runs, spectacular scenery, tranquil Nordic trails, a unique spa treatment (or two?). Or perhaps you're more interested in the ambiance and the phenomenal cuisine of the region, as they say in the Townships, a visit is a gastronomic experience topped with a skiing buffet! If you're looking for a one of a kind, relaxing and thoroughly enjoyable vacation, savoring the region and what each mountain and trail area has to offer this trip is for you! Our home base will be the Estrimont Suites and Spa where you can relax in the lap of luxury. * 5 American buffet breakfasts, with french pastry, mais oui! * Free access to the resort facilities (outdoor hot baths, indoor heated pool, Finnish sauna, Nordic shower, Polar bath and yurt with a fireplace). * Visit the nearby town of Magog and Lake Memphremagog - you'll be able to pronounce it before you leave. To Register, click here to download registration form, and mail along with your check to the trip leader. Instructions are on the form.